Bhawai is a folk dance with swaying and twirling movements that is performed by women from certain tribes from the state of Rajasthan. This folk dance is one of the state’s most exciting dance performances as it involves tricky balancing acts, right from balancing seven to nine brass pots on the head to balancing oneself (along with the pots) on narrow and unstable objects like a glass bottle, brass plate or the edge of a sword. The brass pots can, and are often, substituted by an even greater number of earthen pots. Bhawai is also one of the most colorful performances of the state as the women wear bright colored ghaghra cholis and dupattas. The men from these communities offer the music to this dance, using string and percussion instruments. 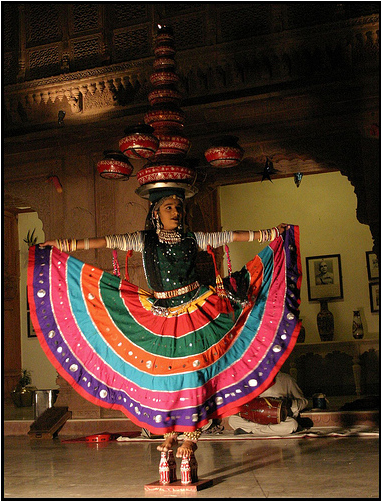 Bhavai dance is often misinterpreted from ‘Bhavai’ which is a folk theatre form of Gujarat. Although many believe that this dance originated in Gujarat and was inspired by a folk theatre art form of the same name, the Bhawai folk dance of Rajasthan has been a part of the state’s culture for a number of years. This thrilling art form is known to be a special custom of the following tribes: Bhils, Raigers, Charmars, Kumhars, Jats, Meenas and even Kalbelias. The Bhawai dance is usually performed during fairs and festivals as well as special occasions such as weddings. The emergence of this dance form can be traced to the household needs of Rajasthani folk, wherein the women were responsible for traveling long distances each day with numerous brass pots in order to fetch water for the family. This dance is inspired by the fact that in the age of feudalism, and to some extent even today, the women of Rajasthan have had to walk for miles on end with a number of pots in order to fill water. 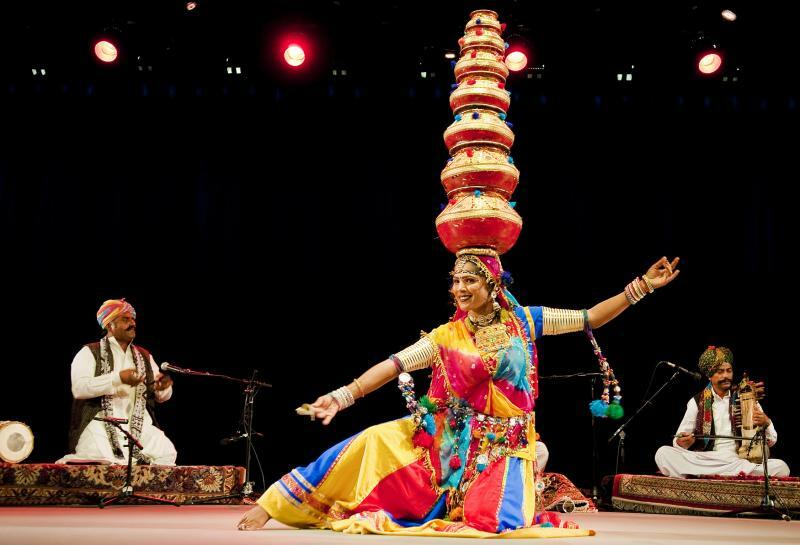 When translated into dance, the women carry seven to nine pots on their heads and perform some of the most exciting feats with grace and ease. The highlight of this dance, besides the balancing of or on objects, is also the depiction of the strength, nimbleness and absolute grace in the posture of the women as they travel back and forth each day from the communal well. This dance is especially colorful due to the bright and vivid hues of the performers’ costumes. This is so because, the culture of the Rajasthani people is to add color to the aridness of their surroundings through their clothes and ornaments. The women, irrespective of which tribe they belong to, wear ghaghra cholis along with colorful dupattas and silver ornaments. The ghaghra as opposed to the lehenga is slightly shorter but is ideal for dancing, especially one as tricky as the Bhawai, as it allows absolute freedom of movement while also safeguarding the wearer from tripping over their own clothes. The costume can be in any color the performer wishes to wear as long as it is vibrant. It is not uncommon to see the performers sporting palette that would otherwise be termed as stark contrasts, such as pink and yellow, red and blue and more. The cholis worn by the women are essentially fitted blouses that end at the waist. They are short sleeved so as to give space to the extensive ornamentation for the arms. The whole ensemble is usually of the tie and dye print, which is one of the most popular craft forms in Rajasthan. Alongside, there are a number of embellishments on the choli as well as ghaghra, the most common being mirror work and gota patti work. There are also colorful tassels in the form of little balls of thread that hang from the sleeves of the blouse or the waist. The dupatta is the primary accessory for the performers. It is draped over the head and made to fall loosely around the shoulders. However, this is only the appearance the drape gives, the dupatta is actually is pinned to the choli at various points. The tassels on the border of the dupatta frame the woman’s face. The border itself is embellished heavily, in contrast to the body of the dupatta which is usually minimalistic. The women wear silver bangles as well as silver armlets, a set of a dozen at least, on each arm. While this is the preferred accessory, women can also wear colorful glass bangles to go with the attire. There are any number of ensembles that men who give the background score to the Bhawai dance can sport. The most common of these is the white or off-white dhoti kurta. This look is completed by the adornment of a colorful sleeveless jacket and a kamarbandh. When the dhoti kurta is plain, the jacket and kamarbandh become the heavily embellished elements of the ensemble. These can have mirror work and can be in a number of bright colors. On the other hand, the menfolk involved in this dance also tend to wear colorful kurtas that end a little below the hips, paired with colorful pajamas. The common aspect of both these ensembles however, is the colorful headdress. Tied using a colorful bandhani cloth, this headdress is a defining characteristic of Rajasthani men. While this is a disparate element, the pots on the women’s heads also play a great part in enhancing the overall style of the dance. Since balancing of the pots is the premise of Bhawai, the artists take great care to decorate the pots as beautifully as possible. Whether brass or clay, there is a lot of effort that goes into beautifying the pots. The way in which the vessels are decorated depends on the customs or beliefs of the tribe and the individual taste of the performers. Bhavai is rapidly declining as an art form. For this reason, the government of Rajasthan, as well as a number of non-governmental agencies, are investing a lot of time and effort into reviving and sustaining it. In the recent years, it has become a major tourist attraction at the many fairs and festivals that are hosted in Rajasthan. For instance, at the Marwar and Desert Festivals of Rajasthan, Bhawai is a popular tourist attraction. This attire is meant for occasional use and cannot be taken as daily wear. However, maintaining the garments is easy because they are made of cotton. Since Rajasthan is a hot and dry state, the people prefer wearing garments made of cotton which keeps the wearer cool and also absorbs sweat. These garments can easily be washed, as long as they are not heavy on embroidery. If the outfit has extensive and intricate embroidery, it is advisable to wash gently by hand and not in the washing machine. The Kalbelia tribe, which is particularly adept at Bhawai, have another dance form to their credit that goes by the name of their community i.e. Kalbeliya. To keep Bhawai alive, a non-profit by the name of Bhawai Lokkala Sansthan of Rajasthan has been set up. When sporting earthen vessels, the number of vessels blanced on one’s head can go up to eleven or twelve. The part of the dance where the women, along with the pots, balances on the brass plate / glass bottle / sword comes right at the end as a exhilarating climax to the dance. The neighbouring state of Gujarat has a folk theatre art form of the same name, in which men dress up in a variety of garbs to play the different characters of the play.